If you’re using a Wacom intuos 3 graphics tablet with Gnome 3, then this little button layout illustration should be useful. 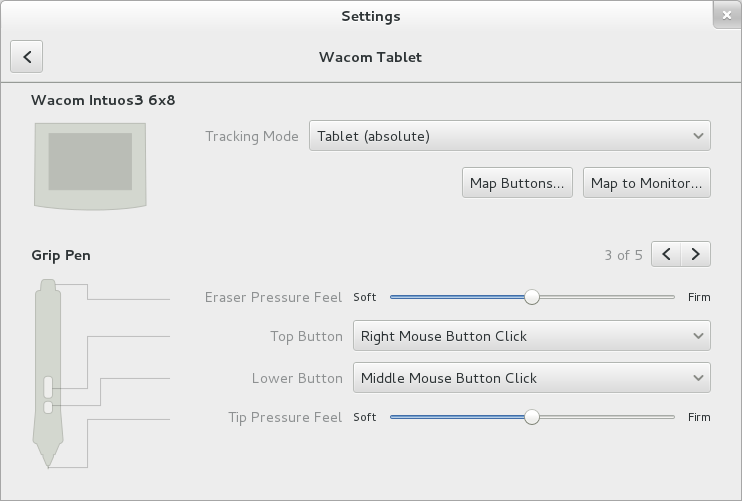 Gnome’s built in Wacom configuration tool is great, but the numbers it assigns to the tablet buttons are not intuitive. Use this diagram to avoid a trial and error approach to function assignment. Tagged as: gnome3, intuos3, wacom. where did the nice GUI Wacom Settings come from? I am using Linux Mint Mate and I find settings a bit primitive. My old Intuos3 Tablet is giving me problems. The touch strip is wonky. As soon as you touch it the mouse goes wonky and requires a system reset. I am using a dual monitor and have had several other issues. What I would really like is to disable wacom and use my tablet in WinXP where the driver works as it should.